My husband Justin & I are on this journey to bring new products that have been extensively researched, tested & improved upon to the point where our customers can really see the thought & consideration that has gone into each of our designs. We love to find everyday popular products such as this one & make them better than ever by tweaking the design, adding extra features, & solving the problems that customers are finding with other similar products on the market. WHAT MAKES OUR STROLLER ORGANIZER UNIQUE? Our exclusive smart design top edge means your new Stroller Cup Holder will hold its shape, look great, stay flat & wont sag, for many years to come! The reinforced top perimeter helps to keep your drinks stable & gives the Stroller Console a vertically collapsible structure which flattens easily on folding prams or during storage & transportation without losing its shape. We've also made our Velcro straps broader than our competitors for better support & stability, & have ensured that the quality & durability of our materials is the best you can find. 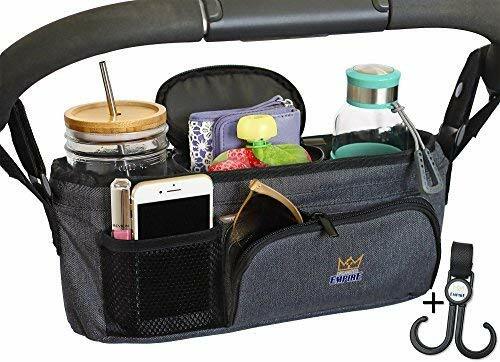 The part we love most about our Baby Organizer is that it quickly comes off & snaps together as a Baby Travel Caddy with carry handle that you can take anywhere with you when you're in a hurry. And don't forget the FREE Stroller Hook that comes as a bonus with your purchase! More versatile & value for money than any other bulky stroller accessories on the market that is 4x the price! If you are not happy with your purchase or if you believe your pram caddy has arrived damaged or faulty, we offer a 100% SATISFACTION GUARANTEED or your money back! Compatible with: Bugaboo Baby Jogger City Select Diono Uppababy BOB Reds Phil & Teds & many more! SMART DESIGN FOLDS WITH YOUR STROLLER - Our exclusive reinforced top perimeter gives the Stroller Caddy with cup holders a vertically collapsible structure which flattens easily on folding strollers, even umbrella strollers, or during storage & transportation without losing its shape and stability. This means busy moms no longer have to take off their baby organizer every time they finish using the stroller. No one has time for that! No need to buy another bulky cup holder for stroller again! COMPACT DESIGN WITH HUGE VALUE & CAPACITY - Includes 2 x Drink Bottle Holders (one for you and one for your little one) - 2 x secure zippered compartments to ensure your loose items and accessories such as coins, keys, snacks, sunglasses & pacifiers do not fall out. - Large hanging mesh pocket for storing magazines, books, diapers, wipes or toys, which discreetly rolls up and folds away when not in use. - And a small quick access mesh pocket for your mobile phone, or baby's pacifier. STROLLER ORGANIZER THAT WONT SAG & LOSE SHAPE & KEEPS YOUR DRINKS LEVEL - Thanks to our UNIQUE REINFORCED TOP PERIMETER that gives our Stroller Cup Holder a firm top edge (developed by boss-mom Sarah - owner of Organized Empire) our design ensures your new stroller accessory holds its shape, look great, stays flat & doesn't sag like other Stroller Accessories, even when fully loaded! Hallelujah! No other Parent Organizer on the market offers this kind of design & we are proud to call it our own! MOST VERSATILE STROLLER ORGANIZER ON THE MARKET - Broad velcro straps for better support & stability, and high quality durable fabric & stitching with LIFETIME WARRANTY. Our cup holder for stroller also converts to a portable baby caddy you can take anywhere with the quick snap carry handle design. Definitely one of the most value packed Stroller Accessories on the market! 100% SATISFACTION GUARANTEED or your money back! BONUS UNIVERSAL FIT STROLLER HOOK - Our Childrens Pram Organizer comes with a multi-directional Stroller Hook with velcro strap to hold your shopping bags in place or your handbag for quick access, and easily secures onto either your buggy handlebar or on the headrest of your car seat while driving. A great gift or present idea for any new parent or Baby Shower & a great stroller bag accessory for travelling on vacation with toddlers or an infant, to keep everything organized and at arms reach. If you have any questions about this product by Organized Empire, contact us by completing and submitting the form below. If you are looking for a specif part number, please include it with your message.